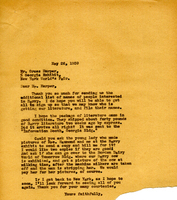 A letter from Martha Berry asking whether the package of literature on Berry for distribution made it to New York in good condition. She also asks for copies of a picture she took at the New York World's Fair with Mrs. Hammond, and promises to pay for the prints. She also asks that a picture be taken of the Berry cow at the exhibit be taken at milking time and sent to her. She offers to pay for this as well.